"Let your voice do the writing ..."? Isn't that what a typewriter is for? 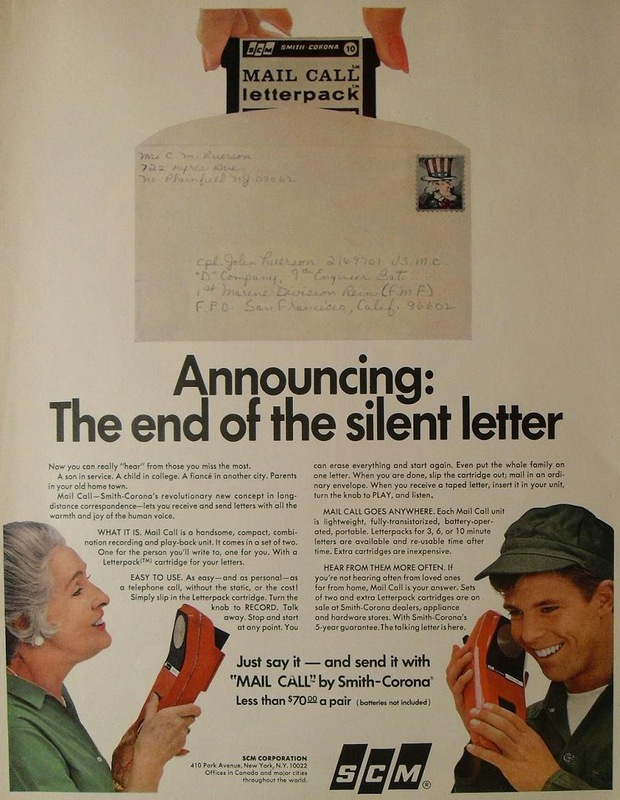 Certainly, one of the main reasons one might buy a Smith-Corona typewriter today would be to write a letter. So why was SCM shooting itself in the foot in 1967? I readily confess I'd paid little heed to one of the items being flogged in the 1967 SCM Christmas advertisement I posted a couple of days ago. I just looked at the typewriters (OK - and the ladies in pyjamas). That is, until comments to the post from Ted Munk and Tina Martin made me go back and take a closer look. Ted wrote, "Yeah, now I want an SCM 'Mail Call'. I wonder what media it used? Knowing SCM, probably some weird, proprietary tape cassette." Tina added, "That Mail Call gizmo is interesting." The "gizmo" was the Smith-Corona Letterpack Mail Call - a PlayTape battery-powered audio cassette player on a two-track format. 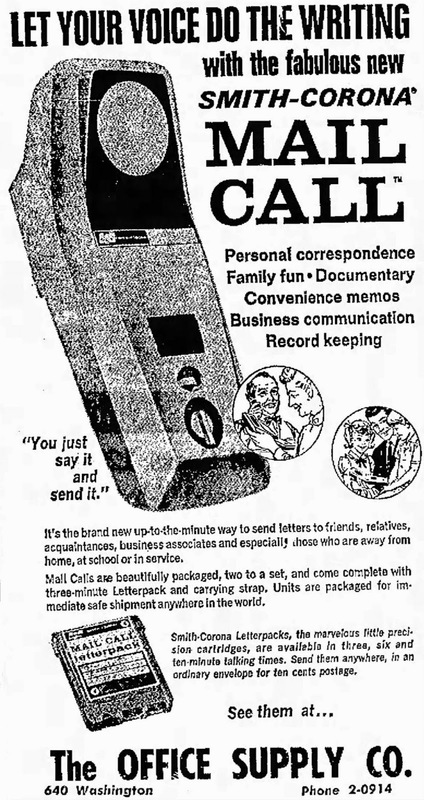 A distant forerunner of voicemail, it allowed users to record messages on small cartridges and mail them to anyone with a matching device. 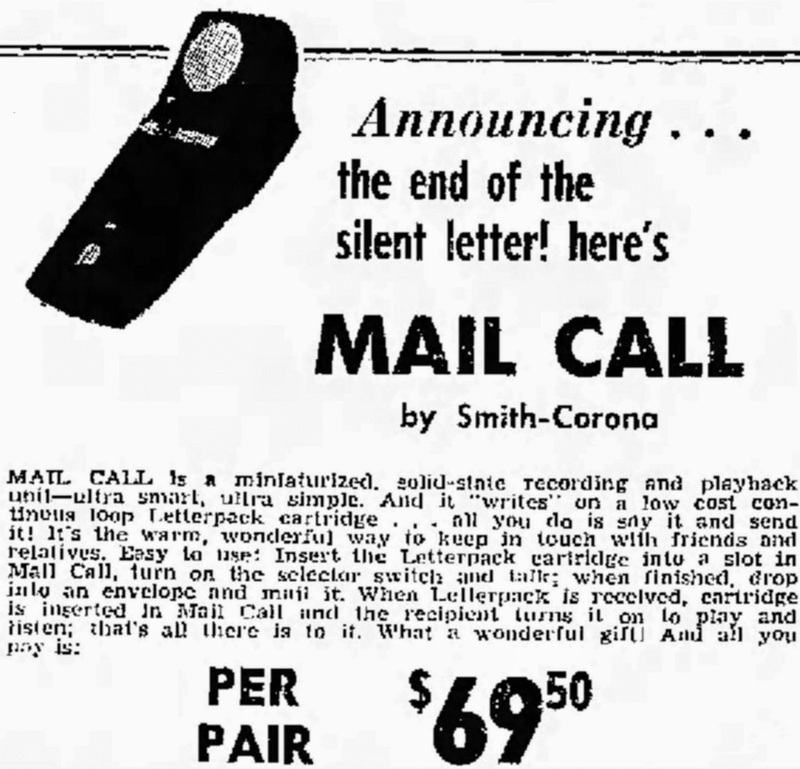 Smith-Corona promoted the system as being "a more personal alternative to writing a letter". The two-unit starter kit cost close to $70. The PlayTape format was soon superseded by the 4-track and 8-track formats and SCM went back to concentrating on typewriters. The short-lived SCM Mail Call device was the work of Frank Stanton (1920-1999), who developed a compact 2-track system while in the US Navy during World War II. 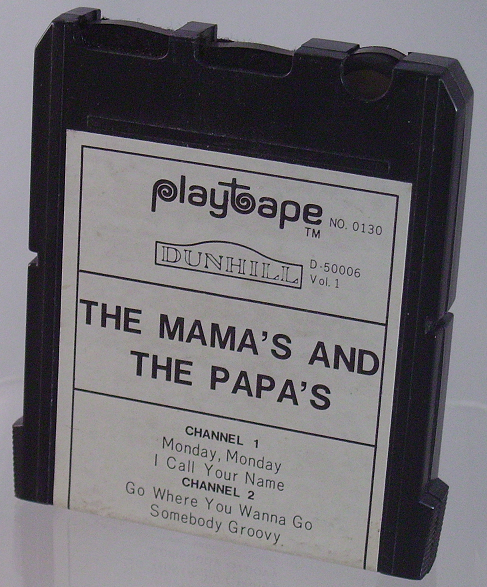 PlayTape was successfully launched at an MGM Records distributor meeting in New York in mid-1966. Apart from MGM, the players were also sold by Sears. 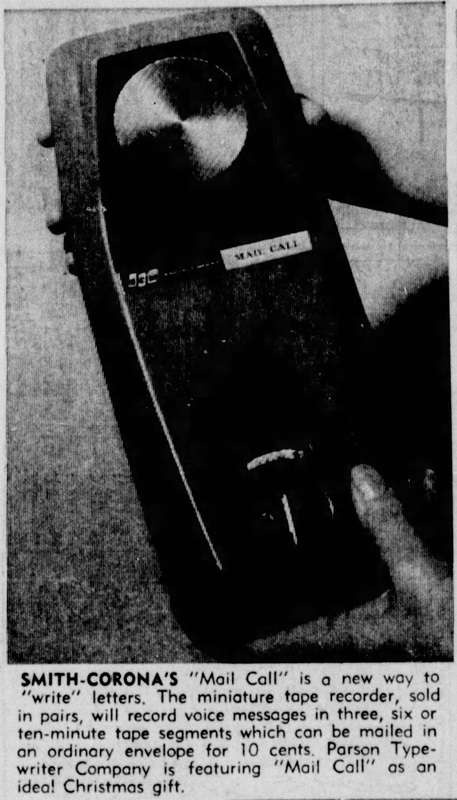 Stanton then introduced a special dictating device aimed at the business market, which he envisioned as a replacement for written memos and letters. His idea was marketed to SCM. While the music market for his players enjoyed limited success, the business side never took hold. When Stanton (born November 30, 1920) died at his home in Water Mill, Long Island, on May 9, 1999, aged 78, he was remembered in a New York Times obituary for being an entrepreneur and real estate investor who developed an early videocassette. His company, World Wide Holdings, was established for trading in surplus goods left scattered around the world in the aftermath of World War II. With a foothold in North Africa, the company became the largest importer of sugar into Morocco. It was later involved in importing Volkswagens, Porsches and Audis into the United States. Later, the company engaged in toy manufacturing and movie distribution. 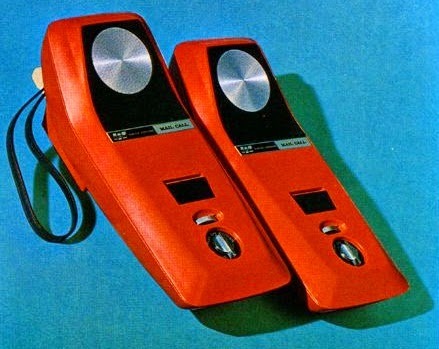 In the late 1960s, World Wide Holdings joined forces with the Avco Corporation, a high-technology manufacturer, to found Cartridge Television, a company that produced a videocassette and player (Cartrivision) which anticipated later developments in the field. In the 1970s, World Wide Holdings branched into real estate. His obituary failed to acknowledge his pioneering work in the field of consumer audio systems. In the US, Volkswagen was the only car manufacturer to offer a PlayTape player as optional equipment. The Volkswagen Sapphire I OEM model was designed for in-dash installation, and included an AM radio. The Sapphire II aftermarket version omitted the radio, and was designed to hang off the dashboard. That video was very interesting. Reminds me if my childhood fascination with audio cassette players, how we'd make impromptu radio programs. 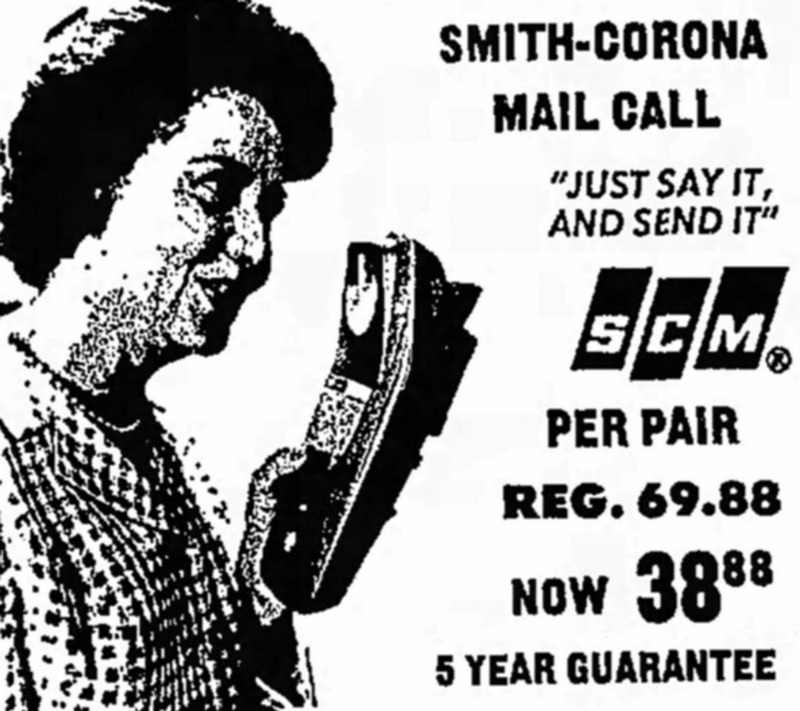 I remember stumbling across one of these in the thrift store, spotting the familiar SCM logo and hoping that it was... I don't know what, actually. Ribbons? Extra type elements for the change-o-type set? An interesting idea, to be sure, though it shows how much market forces can control and evolve a media standard. I remember my folks exchanging reel-to-reel taped letters in the mail with my grandparents, and later exchanging cassettes for the same purpose. Oh, man - I love it! a *looping* tape deck? I bet you could reload those cassettes using tape from a normal cassette.